Now, about those squirrels. Red Squirrels to be exact. The ol' Tamiasciurus hudsonicus. I grew up knowing only one kind of squirrel, the Grey Squirrel. We sang a song about them in grade school. These rodents were everywhere, and still are. Furry, little things that scoot along lawns looking for nuts. More than once I have caught them on my window sill pointing at me and drooling. Here in New England they are as common as Super Bowl Rings. I had never run into a Red Squirrel till I moved to Fiskdale. At first I thought that the chipmunks had started to climb trees. 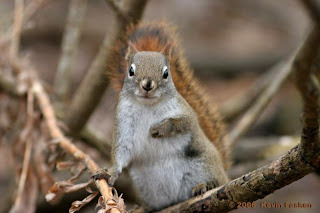 Red Squirrels are smaller than their grey counterparts, and more spastic. Man, do they make noise. Sort of a high pitched chatter that is incessant. I can only imagine what he was yelling at me as I crossed my back yard. He would increase his volumes and get more crazed if a Grey Squirrel happened by. I actually saw this little fur ball leap from high in a tree to the ground and without loosing a beat, he ran off toward the grey squirrel. I always wondered what he would do if they actually caught one. Well, I tolerated the noise for some time, and finally, me and Mister Hav-A-Hart got together and we captured the Red Demon. I brought the crazed rodent to a happier forest, and returned home. After parking the truck, I walked behind the house and there on the well was the Red Squirrel screaming at me. I thought I had entered the Twilight Zone. The damn squirrel not only was louder, and more angry with me, he had actually beat me home from the Happy Squirrel Relocation Forest. Or, so I thought. Come to find out it was another one. I thought I only had one, now there was a sibling, or spouse screaming at me, standing on his rear legs, little arms waving like mad. So, I set the trap up again and waited for the sound of the doors closing tight. Didn't take long. And, off to Peaceful Squirrel Acres we went. I came home, parked the truck, and went around back to kitchen door, said hello to the Red Squirrel sitting on the stoop, went into the kitchen, hung up my keys, and paused. I slowly turned around, took a step toward the kitchen door, and peered out onto the step. There, on the top step was a this obviously ticked off rodent. Standing there, arms crossed, one foot tapping away. You know the look. Where the heck did he come from?! I was awash in Red Squirrel Tide! No sooner did I remove one, than a extra from central casting was sent in to replace him. That day I made a total of nine trips to Happy Squirrel Land with a very upset squirrel in the back seat of my truck. I made an additional trip the following day. Ten trips. Ten squirrels. Strange thing is I never saw more than one of them at any one time. Must be the way they operate. Sort of a one-man show. Funny thing though, the more I took away, the louder, and brazen the remaining ones became. Finally, after a lot of peanut butter bait, multiple trips down the road to the woods, there was peace in the valley once more. After awhile the grey squirrels showed their faces in the yard again, the birds returned to the feeder, and I wasn't scolded from the treetops any longer. This Wild Kingdom moment happened during the summer of 2007. In August of 2008 I was sitting on the back step, peering out into the tree by the well when something caught my eye. It was either a chipmunk in the tree, or we had trouble in River City again. I only saw him a few times after that. This one was very quiet compared to his deported friends. I let him be after I had a few words with him one afternoon. I explained my position, and my expectations to him. I think he understood. I then turned and walked back to the house confident that my position was well stated, and that my four legged, red neighbor would be a good neighbor. By the time I reached the porch the thought hit me that I must have looked like a total nut out there talking to that squirrel. Even luckier he didn't come out that tree, cold conk me and store me away for the winter.